Rami Malek won Best Actor in a Motion Picture (Drama) at Sunday night's Golden Globe Awards, and no-one seemed happier for the Bohemian Rhapsody star than his co-star Lucy Boynton. While celebrating his big win at Fox's Golden Globes after-party, the Freddie Mercury character was spotted planting a kiss on his girlfriend's cheek. Of course, they both had another reason to celebrate. The film also won Best Motion Picture in the Drama category. This wasn't the only after-party they attended. They also celebrated at the Hollywood Foreign Press Association's soirée. While Boynton was seen socializing with other friends, an insider told E! News "it was clear that they are together." The couple dazzled in their award show attire. Malek looked dapper in his tuxedo and Boynton stunned in a gold gown by Celine. The public PDA came just a few days after Malek confirmed their romance at the Palm Springs International Film Festival after months of speculation. While accepting the Breakthrough Performance Award, the 37-year-old actor thanked Boynton. "Thank you, Lucy Boynton," he said, per Billboard. "You have been my ally, my confidant, my love. Thank you so much." For those who haven't seen the Queen biopic, Malek plays Mercury while Boynton plays Mary Austin, Mercury's dear friend and former fiancée. But playing the legendary singer was a far cry from his role in Mr. Robot. Just the audition process alone required him to sing, dance and host a fake press conference—all in front of the band's members, no less. "I think it was a little bit of the mischief I have going on behind my eyes, perhaps—that's what they saw," Malek told E! News' Ryan Seacrest. 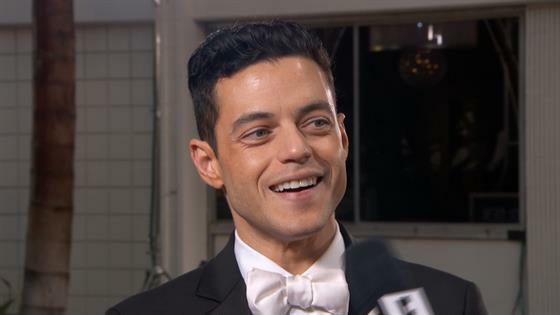 Rami Malek Talks Big Audition Process for "Bohemian Rhapsody"
Malek also played tribute to the late musician during his acceptance speech. "Thank you to Freddie Mercury for giving me the joy of a lifetime," he said. "I love you, you beautiful man. This is for and because of you, gorgeous."